Railway Philatelic Group – The site for all Railway Stamp & Postmark fans! CLICK HERE for details of the RPG 2019 Annual Convention – hope to see you there!!! The RPG caters for all levels of interest, from beginner to expert. If you are just starting we hope you will find something here to take your fancy. If you are an experienced collector we hope that you can share your knowledge with others … and still find something new yourself! 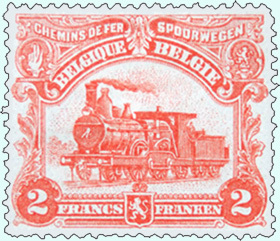 Rather than sticking to collecting railway stamps of just a single country or region, one of the attractions of thematic collecting is to choose a theme or subject and collect railway stamps stamps and related material from all over the world which illustrate that theme or subject. Thousands of stamps worldwide show superb miniatures of steam, diesel and electric locomotives. Others show railway stations, signals, railway bridges, railway tunnels, railway tracks, railway pioneers, and other aspects of railway working. The choice of subject is endless, and is limited only by your own imagination! Since 1830, when the Liverpool to Manchester Railway was opened, trains have been used to carry bags of Post Office mail. Initially, mail was collected locally and taken to the appropriate Head Post Office, postmarked, sorted into mail bags, then taken to a station and put on a train. It was soon realised that time could be saved if the mail was sorted while in transit. This gave rise to the Travelling Post Office (TPO) and its wide variety of postmarks which have generated a great deal of interest among railway philatelic collectors. A Travelling Post Office usually consisted of a carriage (or several carriages) in a normal passenger train, manned and run by Post Office staff. Although the name Travelling Post Office has become embeded in railway history, it might be more meaningful to describe a TPO as a Travelling Sorting Office. A TPO did not do some of the things a normal post office would do, such as sell stamps and postal orders … but it did sort letters and parcels. The TPO carriages were owned by the railway companies, but these TPO carriages were staffed, managed and controlled by the Post Office employees. Our main RPG interest in TPOs is their postmarks. However, bags of mail sent to be sorted on a TPO had already been stamped with the postmarks of the sending Head Post Office and, although interesting in their own right, such postmarks are outside the remit of railway philatelists. Only letters posted directly into a TPO received TPO postmarks. Parcels could not be posted directly into a TPO. Not surprisingly, the railways of many other countries quickly developed their own TPO network. Although items with foreign railway postmarks are less easy to come by, they give us the opportunity to collect and specialise in a whole new range of interesting material. Each country tells its own story. Prior to the development of the railways, when mail was carried cross-country by mail coaches, the Post Office established Forward Offices roughly every 100 miles on the mail coach routes. These were really just sorting offices which received mail destined for that region from the mail coaches, sorted it into districts or post towns, and passed it forward to Head Offices in that region for final local sorting and delivery. When mail was transferred in bulk to the railways, the Post office set up similar Forward Offices on the rail routes … but these railway forward offices, somewhere along the way, became called Railway Station Offices. They were still primarily sorting offices, though they did have a letter box into which people could post letters. 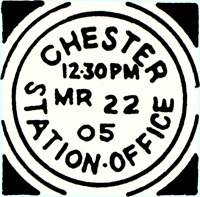 The only letters to receive a Station Office postmark were letters posted directly into the office letter box. As time rolled on, things became a little less precise. Other offices (which were not Forward Offices) began to be called Railway Station Offices simply because they were located at or near railway stations or had the word ‘Station’ (or ‘Stn’) as part of their postal address – which in turn meant that the postmarks used at these Post Offices contained the word ‘Station’ (or ‘Stn’). Thus, over the years there is a range of offices which fall under the banner of Railway Station Office, and the postmarks of all of these offices are very collectible. A further development was the introduction of the Railway Sub Office (RSO), which was a sub post office capable of sorting mail (although it may or may not have provided a full range of postal facilities). A Railway Sub Office was manned by Post Office staff, and sent bags of mail directly to a TPO (and received sorted bags directly from a TPO) rather than sending them to (and receiving them from) its own Head Office. Most RSOs were not located at (and sometimes not even near) a railway station. Nevertheless, RSO postmarks are also very much sought after. The Stamp Act of 1712 levied a Tax on Newspapers, but also gave newspapers the right of free transportation. 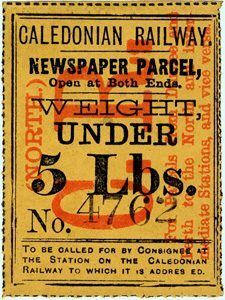 When the Newspaper Tax was repealed (along with the right to free transportation) in 1855, the railway companies stepped into the business of commercially transporting parcels of newspapers. British railway companies produced Newspaper Parcel Stamps for this service; these are very varied and collectable. The Post Office had no monopoly on parcel delivery services, and indeed did not have such a service themselves for many years. British railway companies started general parcel delivery services in the 1870s, and issued Parcel Stamps for these services. 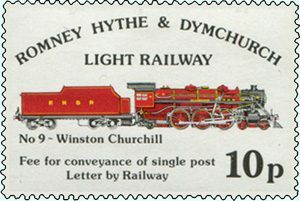 Over the years, most of the British railways issued parcel stamps at one time or another. These stamps are many and various, and have attracted great interest. People tend to collect stamps of the railway(s) which ran in their local area. Note – Railway Stamps of Ireland: Until the creation of the Irish Free State in 1922, the Irish railways were subject to the same rules and regulation which covered other British railways. Collectors have always grouped Irish railway stamps together with the stamps of other GB railway companies. 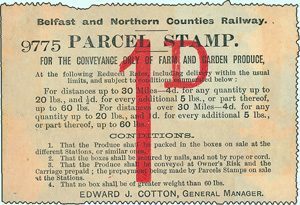 For continuity and convenience we will continue this practice, and deal with the railway stamps of Ireland alongside those of British railway companies. When the Post Office (or, more correctly, the General Post Office) was established in 1660, it was given a monopoly on the despatch of letters from a specific sender to a specific receiver. The railway companies were therefore not permitted to run letter delivery services. In 1891 the Post Office came to an agreement with the railways which allowed any railway which signed up to the agreement to run their own station to station letter delivery service (quite separately from transporting Post Office mails). Special stamps called Railway Letter Stamps were issued by the railways for the purpose of conveying railway letters by train. Railway letters had to carry a Railway Letter Stamp and also a Post Office stamp. Letters could be posted at one station and delivered by train to another station, where they were either collected by the addressee or forwarded to the addressee using the Post Office mail service. By the end of the 1930s, all British railways had switched to using railway parcel stamps on railway letters instead of railway letter stamps. This was effectively the end of traditional railway letter stamps. 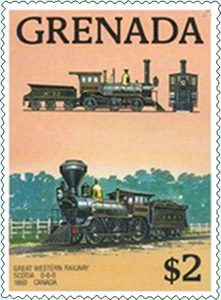 The railway letter stamps of Great Britain and Ireland have proved to be a huge attraction to collectors over the years. Quite a few other countries also issued railway letter stamps. Broadly speaking, we refer to modern railway letter stamps as being those stamps issued post-1950 by modern / preserved / heritage railways, though this is not a precise definition. Whereas the railways of earlier years were strictly commercial concerns run by hard nosed businessmen whose main aim was to turn a profit, the modern independent railways tend to be run by dedicated enthusiasts whose main aim is to preserve the memory and history of their local railways by keeping them alive and running! 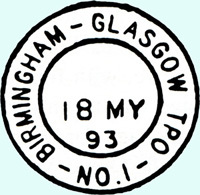 A number of these modern railways have issued railway letter stamps, and some signed up to the 1891 agreement with the Post Office. Some modern railways provided railway letter services which allowed letters to be forwarded onto British Railways lines, whereas others provided services only within their own lines (which in some cases meant the letters travelled only a few hundred yards!). Modern railway letter stamps are generally very attractive and have become hugely popular. They are now much sought after. 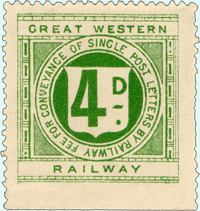 As with pre-1950 Railway Letter Stamps, other countries have also issued ‘modern’ Railway Letter Stamps. Railway companies in other (viz. foreign) countries also issued Letter Stamps, Newspaper Parcel Stamps and general Parcel Stamps. 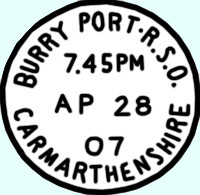 The structure of railway posts varied considerably from country to country and – for convenience only – foreign railway stamps are grouped together (separately from the GB & Ireland railway stamps). There are also a number of railway post related topics which are of interest, such as Perfins, Railway Post Labels, Tax and Revenue Stamps, Railway Postcards, Railway Postal Stationery, Poster Stamps, Telegraph Stamps, Guard’s Marks and much more, each of which can be an interesting and fascinating subject in its own right. 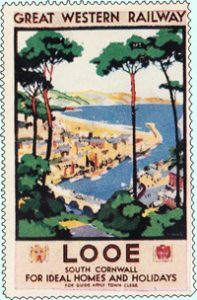 Illustrated left is a Poster Stamp issued by the Great Western Railway. Such stamps were primarily for advertising, and could be used on parcels and letters in addition to the normal ‘fee’ stamps. Although the above areas of interest are presented above as clearly defined groups, there is of course some overlap between these groups – few things in life are absolutely clearly defined!